Shipwrecks: Who owns the treasure hidden under the sea ? 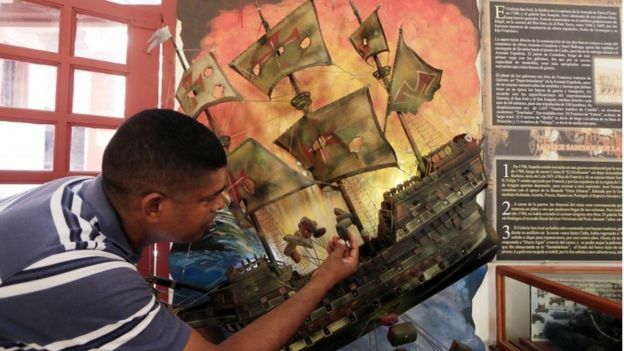 New details have emerged about the San Jose, a Spanish galleon sunk by British ships 300 years ago. The vessel was said to be transporting gold, silver and precious gems collected in the South American colonies to be shipped to Spain's King Philip V to help finance the war of Spanish succession. Colombia said it first discovered the wreck, located somewhere off the coast of Cartagena, in 2015. Last year, the president Juan Manuel Santos said the salvage operation "begins a new chapter in the cultural and scientific history, not only of Colombia but of the entire world". Meanwhile, a team of marine archaeologists, with the help of an underwater robot, started an investigation and have published new information about what has been uncovered so far. Some people have already speculated it could be the most valuable shipwreck of all time and worth billions. The San Jose is one of thousands of shipwrecks around the world and excavating historic cargo is an enticing prospect for archaeologists and treasure hunters. So, who has the rights to a shipwreck ?